Contemporary Classical Music, & Electronics! with special guest Zach Brock-vln. Richard Sussman's ground-breaking "Evolution Suite" for Jazz Quintet, String Quartet, and Electronics is the culmination of almost a decade of development. This five-movement, hour-long composition was funded by a Chamber Music America New Jazz Works Grant, and premiered and recorded on December 20, 2015, at the Leonard Nimoy Thalia at Symphony Space in New York City. It is now slated for an October 7, 2016 release on Zoho Records. Long acknowledged as an accomplished and innovative jazz pianist, arranger, composer, and educator, Richard Sussman has been passionately exploring the inner and outer frontiers of contemporary musical expression throughout his entire career. This includes a keen interest in music technology and the use of synthesizers and electronics in music, as well as a fascination for integrating elements from diverse musical genres. The music for "The Evolution Suite" draws on Sussman's many varied influences and areas of expertise, including straight ahead jazz, electronics, contemporary classical "New Music", and elements from contemporary pop music. The ensemble features members of the acclaimed Sirius Quartet, along with top jazz artists Scott Wendholt-trumpet/flugel horn, Rich Perry-tenor sax, Mike Richmond-acoustic and electric bass, Anthony Pinciotti-drums, and Sussman performing on piano, synthesizer, and laptop, with special guest Zach Brock on electric violin. The result is a truly cutting edge blend of highly original and marketable music with a completely contemporary appeal. "Fundamental to "The Evolution Ensemble" is the belief that in order to meet the changing needs and cultural shifts of 21st century society, it is essential for both composers and performers to evolve in their aesthetic perspectives with regard to the changing artistic landscape. As contemporary composers and performers, I believe we should be free to draw on elements from any available musical genres in the composition of concert music, as long as it can be done in an organic and musical way. Through this process of integration, inclusiveness, and the breaking down of artificial stylistic boundaries, I hope to create music which is a true reflection of the multi-cultural society in which we live, and is also accessible to a wider cross-section of that society, thus exposing and educating a larger portion of the population to an expanded concept of what "concert music" can be." 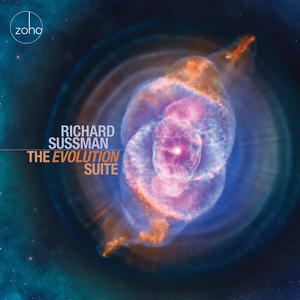 "Richard Sussman's The ‘Evolution Suite' is an amazing and very impressive work! ANTHONY PINCIOTTI drums THE SIRIUS QUARTET: GREGOR HUEBNER violin.